The following is a revised version of an article by Roger Waguespack, published on November 6, 2016 by RDR (Roswell Daily Record) Online. All images are reproduced with the permission of the Historical Society for Southeast New Mexico. Read the original article here. Roswell, New Mexico. Street view of Main Street looking south from Second Street. Nearly all of the buildings seen on both sides of the street have materials from the Mesker Brothers Iron Works, St. Louis, Missouri. Image courtesy of the Historical Society for Southeast New Mexico (HSSNM box 8 414). In the late 1800s and early 1900s many commercial buildings in towns around America featured iron and steel architectural materials. Although larger cities often had local foundries and sheet-metal fabricators, the expanding railroad network allowed smaller communities with railroad connections to access these kinds of materials from national or regional firms. Two prominent companies that mailed out large numbers of catalogs and sold much material across the country starting in the mid-1880s were the Mesker Brothers Iron Works of St. Louis, Missouri, and the George L. Mesker & Company of Evansville, Indiana, which were operated by competing brothers. They produced cast metal columns and beams, elaborate sheet-metal facades and cornices, and other metal architectural items. These materials were easily erected, resisted fire, and provided the structural support to allow large display windows. In addition, ornamental architectural details were incorporated so a building with them would look more visually appealing. Thus, these companies allowed building owners in small, remote communities to have buildings that could rival the beauty and functionality of those in large cities. The popularity of these materials lasted into the early 1900s when architectural styles began to change, and ornate Victorian styles fell out of fashion. 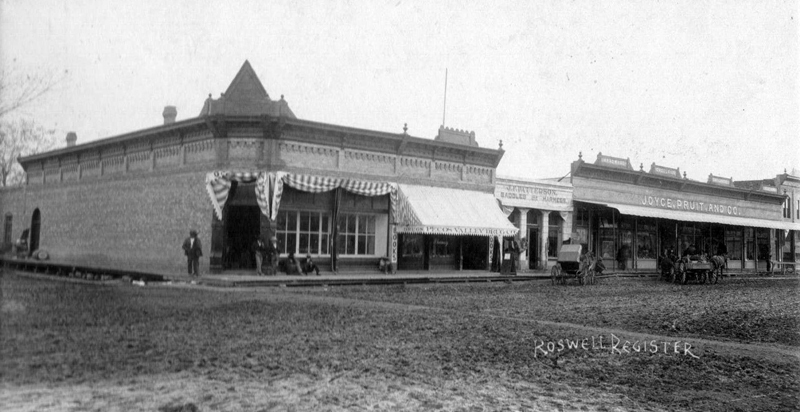 As rail lines moved across New Mexico, a number of towns began to incorporate materials from the Mesker and similar companies into their buildings, and Roswell was one of them. A map from the George L. Mesker & Co. 1915 catalog showed 117 of its fronts had been sold in New Mexico, which ranked thirty-third nationally, and New Mexico was ranked fifteenth nationally and first in the western states as a customer of the Mesker Brothers Iron Works, which sold significantly more material in the state than the George L. Mesker & Co. To solicit business, Mesker Brothers shipped/distributed 15,685 catalogs to New Mexico between 1885 and 1908 with the majority of them post 1900 (11,952). In 1907, they sent out the most with 3,194. 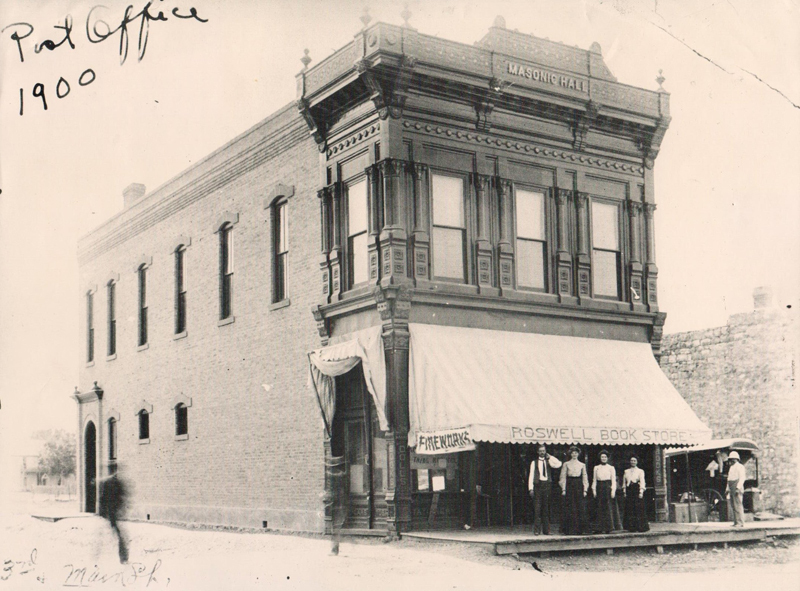 The Masonic Hall Building, which was on the northwest corner of Main and Third Streets, with a full iron front by Mesker Brothers. Often the name of the owner and date of construction are included in the pediment on top of the cornice or the cornice itself. Image courtesy of the Historical Society for Southeast New Mexico (HSSNM box 291688b). Sanborn Insurance Maps of Roswell from the late 1800s and early 1900s, which are located at the University of New Mexico at Albuquerque, show a number of buildings with iron clad fronts. 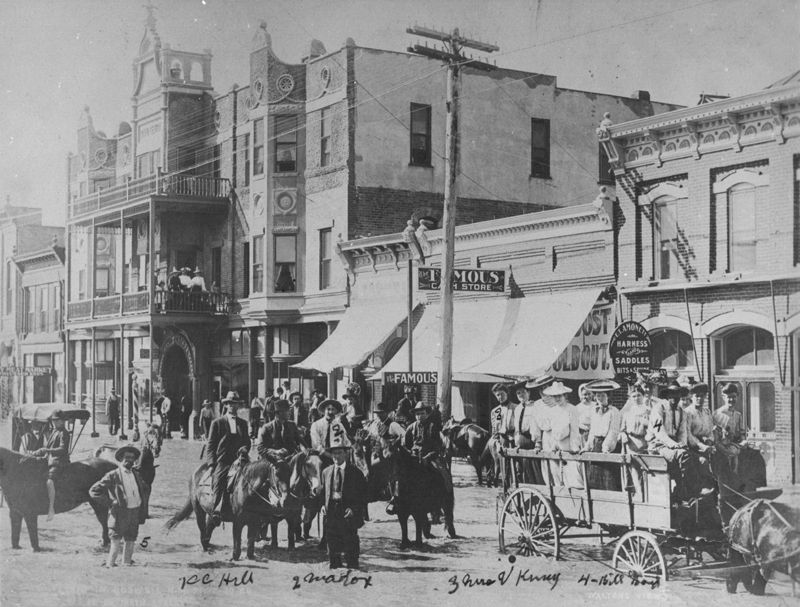 Photographs of street scenes from that time show more than twenty buildings on both sides of Main Street between First and Fifth Streets with cornices, columns, and metal fronts from the Mesker Brothers Iron Works, which was a significant concentration. Roswell appears to have had the largest number of buildings with Mesker Brothers Iron Works material of any community in the country. There could have been more than what has been found so far since some buildings are lacking clear photos. In addition, the maps show iron clad buildings on adjacent streets where no photos appear to exist. These materials were identified by the specific designs used by the Mesker Brothers Iron Works. One of the designs that was used is the fleur-de-lis, which is a symbol of the French heritage of St. Louis. Another is a panel that has a dolphin motif. Company catalogs and an identification guide, which were used to identify the materials, are available via the internet. 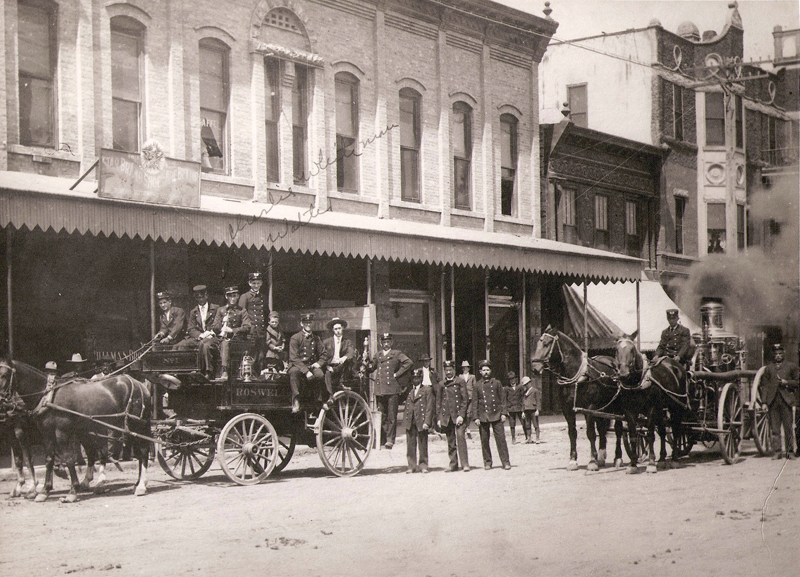 A one-story Mesker Brothers Iron Works metal front was on the Wilson Bros. Building, which housed the Stringfellow-Tannehill Hardware, located on the east side of Main Street between Second and Third Streets. Later photos show that a similar front was added to the left side. 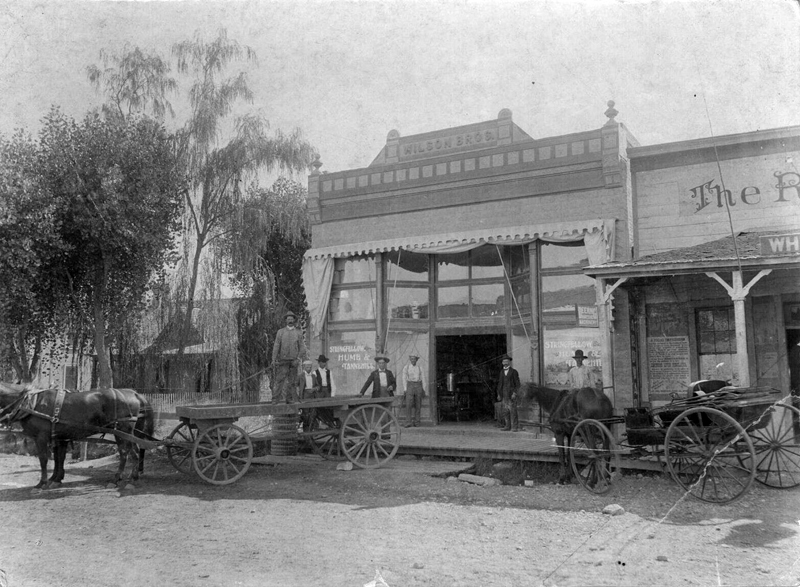 Image courtesy of the Historical Society for Southeast New Mexico (HSSNM box 18827). The Mesker Brothers Iron Works lists some customers as references. The Jaffa-Prager Company in Roswell is mentioned as a customer. There’s uncertainty about the location of that building, though. On the 1905 Sanborn Map, Jaffa-Preger (sic) is shown as a string of one-story iron fronts on the east side of Main Street about mid-block between First and Second Streets; however, the Joyce-Pruit Company predates the Jaffa-Prager Company in what appears to be the same Mesker Brothers fronted building at that location. Another one-story Mesker Brothers Iron Works metal front is on the building that housed the Joyce-Pruit Company, and later Jaffe-Prager, located on the east side of Main Street between First and Second Streets. Image courtesy of the Historical Society for Southeast New Mexico (HSSNM box 6 310). In addition to the metal fronted buildings, a number of buildings with brick and stone fronts included Mesker Brothers Iron Works cornices and columns. This one-story building at the southeast corner of Main and Second Streets is an example. 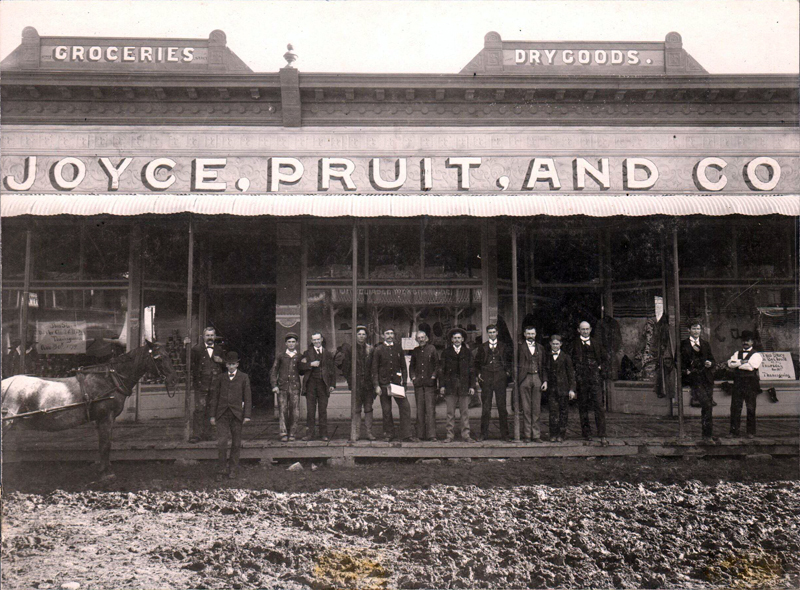 Joyce, Pruit and Co. visible on the right. Image courtesy of the Historical Society for Southeast New Mexico (HSSNM box 10510). Unfortunately, none of the Mesker materials in Roswell survive, but several communities in New Mexico still have buildings with materials from the Mesker companies. Close to Roswell, a Mesker Brothers Iron Works metal storefront still exists on a building at 919 N. New York Avenue in Alamogordo, and the Brown Building in White Oaks has some Mesker Brothers Iron Works materials. Silver City has the most survivors in the state, followed by Aztec and Raton. Farmington, Wagon Mound, Las Vegas, Lordsburg, Folsom, Kingston, Clayton, and Mesilla also have at least one. Most materials are from the Mesker Brothers Iron Works, but a few are from the George L. Mesker & Company of Evansville, Indiana. Aztec has a very rare example of a building with materials from both Mesker companies. In the foreground is the Gaullieur Block (1894) at the northwest corner of Main and First Streets, with Mesker Brothers’ storefronts and cornice. To the right is Meskers’ iron front with signature “dolphin panels.” Image courtesy of the Historical Society for Southeast New Mexico (HSSNM box 8 392). Over the years, Mesker storefronts and other architectural details have been lost to weather, fire, neglect, and modernization. The realization that this piece of American history is being lost and that even documents recording building histories like historic markers and the nominating forms for listing in the National Register of Historic Places often omit any mention of the manufacturers of a building’s components has sparked an interest to document this history. Darius Bryjka of Springfield, Illinois, is leading a volunteer, collaborative effort to document existing and former buildings with materials from both Mesker companies. The ones in Roswell have been added. The large number of sales from surviving accounting records indicates that there are likely others in New Mexico to be found in old photographs, and there may even be a couple more survivors. 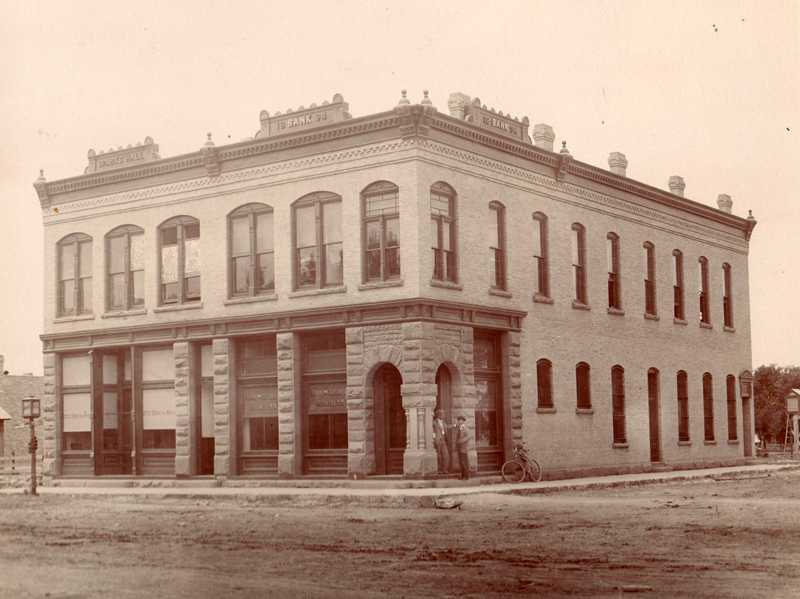 The cornices on the three buildings in the foreground, which were on the west side of Main Street between First and Second Streets, came from the Mesker Brothers Iron Works. Image courtesy of the Historical Society for Southeast New Mexico (HSSNM box 16686). I would like to thank the Historical Society of Southeast New Mexico for allowing me access to its photos. I would like to specifically thank Janice Dunnahoo and Larry Alsup who helped me with accessing photos in the collection and answered questions. I enjoy meeting people who share an interest in history and are so dedicated to preserving the histories of their communities. A wonderful resource to identify metal-fronted buildings is Sanborn Insurance Maps. These maps show buildings in communities starting from the mid to late 1800s. The maps are color-coded, with yellow for wood, red for brick, blue for stone, and gray for metal. Buildings with metal coverings, like those with Mesker materials, are labeled as iron-clad. A collection for New Mexico towns is located at the University of New Mexico in Albuquerque. Sometimes local museums, libraries, and archives have copies for their communities. The Bank of Roswell (First National Bank)–Sparks Hall Building has a Mesker Brothers Iron Works cornice and pediments. Image courtesy of the Historical Society for Southeast New Mexico (HSSNM box 7 323). I took some photos of some details of a mesger building while I was in Silver city nmx. I’d be happy to send them to you. That would be great! Or you can post them to the Mesker Brothers group page on Facebook. Thanks!